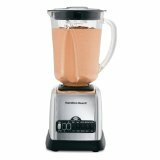 Hamilton Beach Blender Buyers Guide. 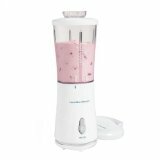 This Hamilton Beach blender has a very powerful 800 watt motor which is much more powerful than the Oster blender. Comparing it to Oster I find that it is much quieter also. You get a very durable machine with this model as it is an all metal unit. The 48 ounce glass jar and all of the other removable parts are all dishwasher safe. Even the lid which is made of flexible plastic can be put in the dishwasher without harming it unlike the Oster lid which has to be hand washed. This is a very attractive unit with the stainless steel base and would be a great addition to any kitchen counter. This unit also has a unique system of blending called the revolutionary wave-action system. This system is much better at getting rid of all of those annoying chunks because it is better at getting all of the ingredients to flow down to the bottom of the jar to get thoroughly blended. The price is in the mid range making it a very attractive buy considering all of the functions and the durability of the unit. This economical Hamilton Beach Blender works much better than you would expect from a unit that costs under $20. Even at this low price it makes shakes and smoothies without too much effort. This is a single serve blender with a low powered 175 watt motor. Even though it is low powered it works just fine for all your blending needs, and it is cheap enough to replace the whole unit if something breaks. Blades are made of stainless steel so they will hold up well. The jar also doubles as your drinking container and as a travel cup, and it will fit most automobile cup holders making this a very convenient unit. If you do intend to use it in your car it has a travel lid to keep from spilling your beverage. 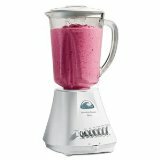 This is an inexpensive Hamilton Beach Blender that has a very powerful motor. No problem with making smoothies and shakes. Being left handed would have liked if you could put the jar on either way. Not very left handed friendly. 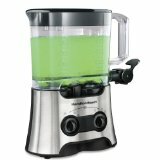 Like other Hamilton Beach blenders this one also has the Wave-action system which is great for getting very smooth drinks. It does this by making sure that all the ingredients are pulled down into the stainless steel Ice Sabre blades for blending. None of the ingredients get missed. You get a large DuraBlend jar that has a 48 ounce capacity and is easy to clean because you can put it in your dishwasher. Unit comes with a pulse function and four speeds which are controlled by a turn dial. Personally, I would have preferred buttons, but that is just me. Smoothies for Life! Yummy, Fun, and Nutritious! 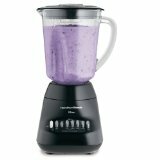 This is a mid-priced Hamilton Beach Blender that has 14 push button speeds that comes in black. Ingredients are ground and blended thoroughly to get rid of any and all chunks to result in a very smooth drink. This is accomplished by the patent-pending Wave-action technology that is used by Hamilton Beach with this blender. Plus you get a very, very powerful 700 watt motor which can handle just about any kind of ingredient from ice to frozen fruits and vegetables. Blades are durable being made of stainless steel and the unit comes with a large 48 ounce capacity glass jar with measurements on the side and a very long three year warranty. This Hamilton Beach Blender is very quiet during operation and works very fast to get the job finished. This Hamilton Beach blender is easy to clean and very easy to use. This blender mixes everything from top to bottom, not just the ingredients that are at the bottom of the jar. Has a stain free glass jar that has a 40 ounce capacity and is safe to put in your dishwasher. A powerful 450 watt motor with stainless steel Ice Sabre blades and a base that is stable and won't float across your counter while operating. This unit uses the patent pending Wave-Action system and has a three year limited warranty. 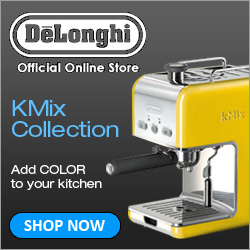 This is a stylish model that will look good in any kitchen. 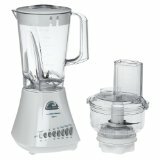 This is a combination of a Hamilton Beach Food Processor and the Model 52654 Wave-Action Hamilton Beach Blender. You get a powerful 450 watt motor with 12 speeds that is a bit on the noisy side. The jar is made of plastic rather than glass or metal. The jar is a Durablend plastic jar that has a capacity of 56 ounces. I would have preferred a glass jar as they don't absorb odors and don't cloud from washings. The food processor is actually an attachment and not a complete separate unit that has a 3 cup capacity. The Ice Sabre Blades are durable as they are made of stainless steel and should last a long time. 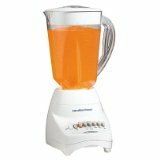 This is a Hamilton Beach Blender that has 10 speeds, 700 watt motor, double-insulated 56 ounce capacity pitcher, Wave-Action system, cup activated dispenser, 3 year warranty, and measures 8.5 inches x 4 inches x 16 inches. This machine works beautifully. 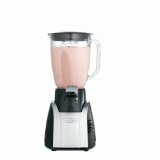 Makes great smoothies, malts, shakes, slushies and much more. Thoroughly mixes all the ingredients after which it cleans up easily. 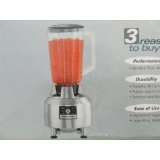 This unit is similar to the other Hamilton Beach Blenders listed above. 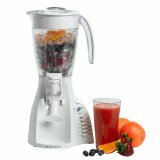 Cleans easily, mixes smoothies and more with ease, and is durable. However, it is noisy while operating. 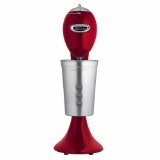 This is a Hamilton Beach hand blender that comes with a 200 watt 2 speed motor and sports two attachments. The 8.5" sharp bladed blending wand will puree soups and whip milk shakes and malts. Has a 7.25" stainless steel whisk and comes with a 5 foot long extra length cord. Unit is very easy to operate and easy to clean. Blend your ingredients right in the bowl, glass or pot. No need to clean up extra mixing bowls with this handy little gadget. Warranty is for one year. 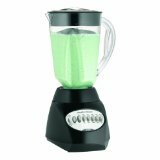 Very powerful Hamilton Beach Blender with 750 watts of power to bring you drinks without chunks at a very fast rate of speed. You get simple to use push button controls, a glass jar that comes with a tight fitting lid to keep liquids inside rather than on the outside of the jar that has a 48 ounce capacity and is dishwasher safe. Very sharp and long lasting stainless steel ice crushing blades make quick work of blending ice cubes and frozen foods. Unit has a three year warranty and measures approximately 10 inches x 10 inches x 15 inches. This Hamilton Beach Blender has dual everything, makes smoothies etc. quickly and cleans up easily. You get a very powerful 1000 watt motor. 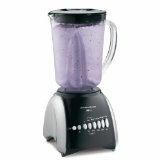 Overall this is a wonderful blender if you need one with these features and want to have a blender that is very fast. Parts are dishwasher safe and the pitcher has an 80 ounce capacity. You can use one cup or both at the same time. Has 2 sets of blades and two motors for making two different drinks simultaneously. 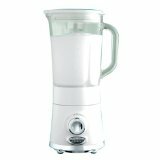 Commercial immersion handheld blender with durable 175-watt motor. 2 speeds for blending, pureeing, emulsifying, and whipping. 9-inch stainless-steel chopping shaft; 4 blades with 5 cutting edges. Blade guard; shaft detaches for easy cleaning; built-in storage hook. Measures approximately 3 by 3 by 17 inches; 1-year parts-and-labor warranty. 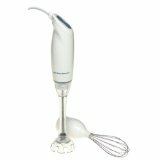 The Hamilton Beach Hand Blender. Cleanup is snap with noting to take apart. Make frothy milkshakes, fruit drinks, salad dressings. Hamilton Beach 59730 BlendMaster Jr.
Blade Rinses for quick and simple cleanup. Unique blade helps prevent messy splashes. 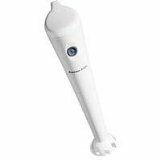 Hamilton Beach 1SPD Hand Blender. Ergonomic grip, stainless steel blade. Extra-long 5 feet cord. 120 watts of power. Wave-Action system forces mixture down into the blades for smooth results. Dishwasher safe 48-Ounce glass jar. 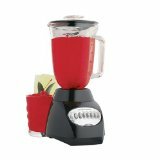 Additional Merchants 12-speed countertop blender with powerful 400-watt motor. Extra-large 44-ounce square glass jar; handy measuring marks. Stainless-steel Ice Saber blades crush ice easily. SureRest safety base sits flat on countertop or table for stability. Measures 7 by 10 by 11 inches; 3-year limited warranty. 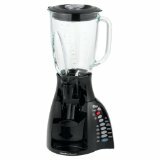 Additional Merchants Countertop blender with powerful 500-watt motor. Comes in Pineapple, Moroccan Red, Licorice, Sugar (White), and Apple. Die-cast metal construction; stainless-steel ice-crushing blades. 2-speed dial and pulse for maximized blending versatility and control. Large 48-ounce glass jar with Sure Rest base; user manual and recipes included. Measures approximately 6 by 6 by 14 inches; 3-year warranty. Additional Merchants Precision motor with 2 speeds. Die-cast metal drink mixer. Can be used for a number of recipes from ice cream to omelets, pancakes, and more. 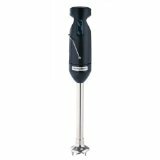 Durable commercial-grade stainless-steel spindle which features double agitators. Easy removal of mixing cup with the tilt-back head. Includes 20 ounce stainless steel mixing cup which is dishwasher safe. Comes with recipes and a user manual. Also comes in a wide variety of colors. Carries a 3 year warranty. Crushes ice and blends shakes, smoothies, and frozen drinks. 350-watt motor with pulse function equals just the right amount of control. 48-ounce glass jar--great for parties. Removable cap covering filler hole in jar's lid serves as a 2-ounce measurer. Additional Merchants Revolutionary Wave-Action system pulls mixture down into the blades for smooth results. 48-Ounce dishwasher safe glass jar. 550 Watts peak power motor. Patented stainless steel Ice Sabre blades. 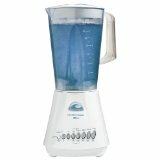 Hamilton Beach Wave-Logic Blender with patent-pending wave action technology, providing the best blending performance available in a consumer blender. Wave-action blending. 10 speeds / 600 watts peak power. 50% thicker heavy duty plastic jar. Ice crushing blades. 3 year warranty. 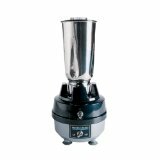 Additional Merchants This versatile bar blender features 2-speed power, durable stainless steel blades and a break resistant 44 oz. polycarbonate jar. Easy to service parts and accessories like the flexible, easy-to-change neoprene clutch assembly designed to increase motor life. Measures 6-1/2''Width x 6-1/2''Diameter x 14-1/2''High. 1 Year parts and labor warranty. Features a 3/8 H.P. motor. 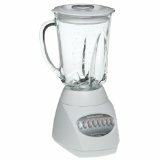 Additional Merchants 12-speed Wave-action Blender with 400 watts of power. Patent pending wave-technology provides superior mixing & ice crushing with no leftover ice chunks. 48 oz Wide mouth Glass Jar. 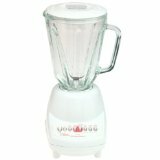 Additional Merchants 750-watt blender with WaveAction system ensures smooth results. Stainless-steel ice-crushing blades; simple push-button controls. Optional dispenser valve for convenient serving; easy-to-clean design. 48-ounce dishwasher-safe glass jar; tight-fitting lid. Measures approximately 9 by 12 by 15 inches; 3-year warranty. Additional Merchants Commercial drink mixer housed in heavy-duty die-cast metal. 3-speed rocker switch, plus pulse switch for maximum mixing control. 1/3-horsepower motor with sealed, permanently lubricated ball bearings. Dishwasher-safe cup guide; 28-ounce stainless-steel mixing cup included. Measures 6-3/4 by 6-1/2 by 20-1/2 inches; 1-year limited warranty. 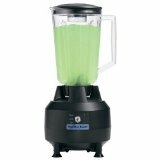 Additional Merchants This Hamilton Beach blender features a Wave-Action system that forces your drink mixture down into the blades for smooth results. The jar has an extra-large, 56-ounce capacity. 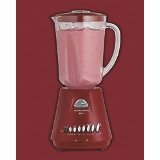 The blender features 12 speeds and operates on 500 watts of peak power. Stainless steel Ice Sabre blades. Sure Rest jar base. 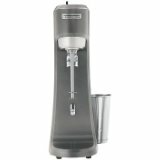 Perfect for making blended drinks--smoothies, margaritas, daiquiris, and iced cappuccinos. 4 stainless steel cutting and mixing blades ensure perfectly smooth drinks. 32-ounce, durable, stainless steel container with a snug fitting, 2-piece vinyl lid. Includes 3-wire grounded plug, Sure Grip feet, and self-aligning collar. Measures 6 by 6 by 14-3/8 inches; 1 year parts and labor warranty. Commercial quality powerful 3/8 Hp motor. Rubber clutch is built to last. High/low/off toggle switch is easy to reach and control. Large 44 oz. break resistant polycarbonate jar. 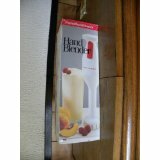 Hamilton Beach 911993900 commercial blender cutter blade. Hamilton Beach 280023801 blender jar lid center fill cap. Fits Blender models 908, 909, 918 & 919. Complete blender motor assembly for the HBB908 model blender. 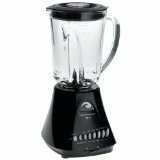 Fits Hamilton Beach commercial blender models 908, 909 etc. Hamilton Beach rubber blender foot for 908, 909, etc. 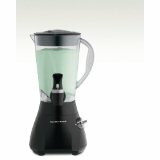 Hamilton Beach lid for GLASS blender jars.